Creating virtual machines for your customers is useful for them and lucrative for you. This excerpt outlines VMware ESX Server's creation and cloning tools. VMware ESX Server has tools available for command-line creation and cloning of virtual machines.These tools are available via the service console and require that you access the service console with root-level privileges. Three main steps are involved to create a virtual machine utilizing the command-line tools. Virtual machine configurations are stored as files with a .vmx extension.The VMX file is just a text file with specific fields that define the virtual machine's configuration.A very short vmx file only needs 14 lines to support a virtual machine that encompasses one CPU, one hard drive, and one network adapter.You could create a VMX file with just three lines but it would be of minimalvalue. Code Listings 4.1 and 4.2 show sample VMX configurations. scsi0:0.fileName = "ESX Created VM.vmdk"
As you can tell from Code Listings 4.1 and 4.2, the only difference is in the values of the config.version and virtualHW.version entries.These values relate to the version of ESX Server you are running.To check the values for these fields, open up an existing virtual machine's configuration file in a text editor. uuid.bios = "56 4d ee 3c 52 06 a3 de-be 4a 73 9c cc 79 25 2b "
You now have a basic understanding of how a virtual machine configuration file is constructed and are ready to build your own.The steps that follow detail how to create a new virtual machine configuration file. Log in locally or connect to your ESX server remotely. Log in with an ID that has root privileges (see the Tip in the previous section), as shown in Figure 4.1. Change to the location of where you want to put your new virtual machine.Virtual machine configuration files (VMX) have to be stored in the same location as the other virtual machine files (VSWP, VMDK, and so on). See Figure 4.2. Create a new directory to store your new virtual machine in newvm and change to that directory (see Figure 4.3). You are now ready to create your new virtual machine configuration file.We are going to use the built-in text editor VI to create our configuration file.Type vi newvm.vmx and press Enter (see Figure 4.4). Press I to turn on inserting (you will see the word insert at the bottom of the screen). Type in the following example virtual machine configuration file (see Code Listing 4.4). Press the Esc key to exit the insert mode, then press and hold Shift and press ZZ to save and exit (see Figure 4.5). Type ls –l to get a directory listing.You should now see your new virtual machine configuration file (see Figure 4.6). You are now ready to go on to the next section to create the virtual disk newvm.vmdk that you will be referencing in your configuration file. 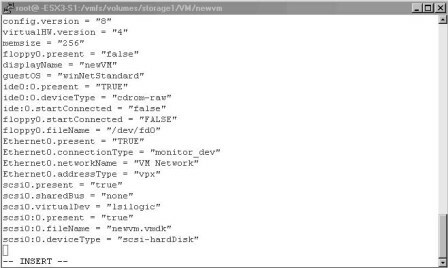 VMware has a command-line utility, called vmkfstools, which can be used for the creation of VMFS file systems and virtual machine disk files. In this chapter, we will only focus on the options that pertain to virtual disks. For a full listing of command options, type vmkfstools in a console session or man vmkfstools. Code Listing 4.5 lists the vmkfstools options that pertain to virtual disks. In our example, we will create a 4GB virtual disk called newvm.vmdk and assign it a SCSI LSI Logic adapter. In the console, type the following: vmkfstools –c 4g newvm.vmdk –a lsilogic.Then, press Enter (see Figure 4.7). We have now created a virtual disk file newvm.vmdk in the same location as our virtual machine configuration file.The last step is to register this new virtual machine with ESX Server. VMware includes the vmware-cmd command tool for performing various operations on virtual machines and the server. In this chapter, we will focus on the virtual machine registration option of this tool -s register. For more information on all available tool options, type vmware-cmd at the console command prompt. "Your Path" should be in a similar format to /vmfs/volumes/storage1/ (see Figure 4.8). A returned value of "1" after running this command indicates a successful registration of the virtual machine. Open up the GUI of your ESX server to verify that the new VM is listed.At this point, you are ready to power on the virtual machine and install your operating system.You have successfully created a new virtual machine utilizing the VMware command-line tools. Use the following table of contents to navigate to chapter excerpts, or click here to view Chapter 4 in its entirety. Lead author Al Muller is a consultant for Callisma, a wholly owned subsidiary of AT&T. He has been in the IT field since 1995, getting his start as a database administrator in the Navy. In 2002 he began using VMware's GSX Server and within a year was involved in his first virtualization project. Since then, he has been an eager proponent of virtualization technology and has worked on a number of different server consolidation and virtualization projects.